GQ's MOST STYLISH MAN OF THE YEAR - 1998 This thing has got to be rigged. Men of the Year? 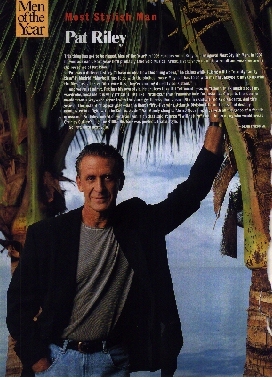 In 1996 our readers voted Riley our inaugural Most Stylish Man. In 1997 he won as Coach. Next year he'll probably take Solo Musical Artist, just to show us all how small and weak we are in the presence of Pat Riley. Pat has a different story. "I have no idea how this thing works," he claims while taking a little "quality family time" in Madrid. "Maybe it has to do with the clothes I wear. Maybe it has to do with my hair. Maybe it has to do with the Mercuries I drive. Whatever it is, they're keeping it pretty consistent." And we must admit, Pat has his own style. He prefers to call it "efficient" - as in, "I don't think much about my wardrobe, because it is very efficient." We like "ruthless." That franchise hair, for instance. One gets the idea he would treat a wayward strand with the same gentleness that Joseph Stalin used with noisy dissidents. And this year, at the instant of apocalypse - as the Heat's fifty-five wins, the Atlantic Division title and season of destiny combusted in a fight with the Knicks, as Jeff Van Gundy clung to Alonzo Mourning's leg with all the grace of a febrile opossum - Pat Riley looked on with an iron mien that said at once "I will return" and "I know a guy who would break Charles Oakley's legs for $100." His hair was perfect was perfect. That's style. So, Pat, until next year.